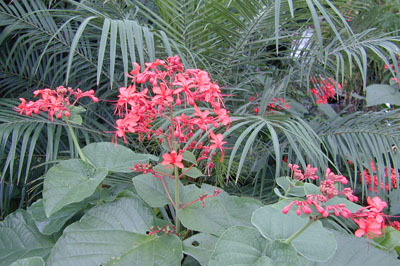 Description: Clerodendrum speciosissimum, or Glory Bower, is cultivated for the ornamental value of its large panicles of bright, orange-red flowers. Glory Bower is a tropical, evergreen shrub with large, heart-shaped, velvety leaves, growing as tall as 12 feet. This species is native to the Indonesian island of Java, where it grows commonly in forest clearings in the low mountains. Clerodendrum speciosissimum is one of eight Clerodendrum species growing in the Butterfly House conservatory.